Researchers say that dogs' ability to digest starch was enhanced due to genetic changes that probably occurred in parallel with domestication thousands of years ago. 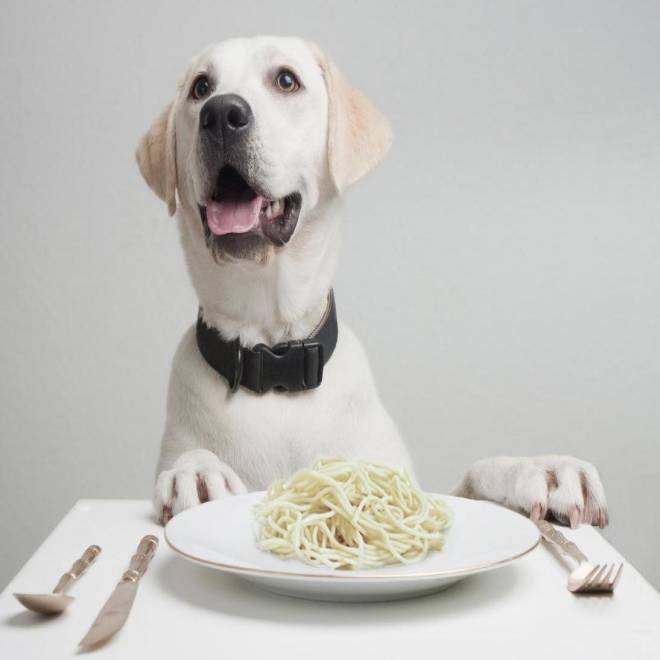 Like humans, dogs underwent genetic changes thousands of years ago to adapt to a diet with more starch, researchers report. They say the change suggests that the rise of agriculture and the domestication of dogs might have gone hand in hand — but it'll take further analysis to confirm the connection. "All dogs studied have this change, which I'd say puts it at least a couple of thousand years back in time," lead author Erik Axelsson of Sweden's Uppsala University said in an email. "But we cannot prove that it coincided with the onset of agriculture. This is something we are continuing to work on now." The genetic shift, reported in this week's issue of the journal Nature, emerged from a detailed, genome-wide search for differences between a group of 60 dogs and a group of 12 wolves from around the world. Axelsson and his colleagues say this is the first such search ever done for dogs. "Only some years ago, a study like this would have been impossible due to sequencing costs," Axelsson explained. "Now it is relatively cheap. We started this study late in 2009 — that is, these projects take time." Dogs are thought to have diverged from their wolvish ancestors tens of thousands of years ago, helped along by their proximity to ancient humans. Some experts would even say that humans co-evolved with domesticated animals. Past research has shown that wild breeds such as silver foxes can be turned into docile doglike creatures over the course of just a few generations. But what genetic changes accompanied domestication? That's what the dog-vs.-wolf comparison was all about: The international research team found 36 regions of the dog genome that showed signs of selective pressure, either because they were so different from the wolf genome, or because the genetic signature became so common among different breeds of dogs. Nineteen of the regions had to do with nervous system function — for example, the ability to create new connections in the brain. "These findings support the hypothesis that selection for altered behavior was important during dog domestication," the researchers wrote. Other regions had to do with the binding between sperm and eggs, or anatomical structure. Then there were 10 genes that related to starch digestion and fat metabolism. "We propose that genetic variants within these genes may have been selected to aid adaptation from a mainly carnivorous diet to a more starch-rich diet during dog domestication," Axelsson and his colleagues said. The genetic changes enhanced a dog's ability to break down starch by secreting an enzyme known as amylase in the pancreas. Wolves don't secrete nearly as much amylase, and thus they don't tend to eat starchy foods. Why would starch digestion play such a significant role in dog evolution? Researchers have previously suggested that dog domestication began when wolves were attracted to waste dumps near agricultural settlements in ancient times. "A process of natural selection started in this new niche that favored wolves that were efficient at this process," Axelsson said. "Being an efficient scavenger included being less shy, so as not to waste energy on running away when humans approached. This idea is supported by our evidence of selection in nervous system development genes, as they are likely to have effects on behavior. "A completely new piece to the puzzle is our finding of a more efficient starch digestion in dogs," he continued. "This could mean that efficient scavenging also included having an efficient system for processing starch. That is, only wolves that could make good use of the scarce and mixed leftovers survived to become the ancestors of dogs." Axelsson noted that other researchers have seen signs of similar genetic changes in human populations, which apparently made it easier for ancient farmers to handle a starchier diet. "The change in humans is less obvious, which makes sense, considering we were omnivores rather than carnivores prior to the agricultural revolution," he said. Thanks to the rapid advance of gene sequencing, similar studies can now be conducted not only for dogs, but for other domesticated animals as well. Axelsson and his colleagues conducted such a study relating to chicken domestication several years ago, and now that dogs have had their genomes done, cats can't be that far behind. "I would be surprised if people aren't working on that now," Axelsson said. "It definitely preferred meat, but would happily feast on, for instance, potatoes," Axelsson said. "This, by the way, is probably important to note — dogs still prefer meat, but during their evolutionary history it was crucial for their survival to adapt to a diet that included a lot of starch as well." In addition to Axelsson, the authors of "The Genomic Signature of Dog Domestication Reveals Adaptation to a Starch-Rich Diet" include Abhirami Ratnakumar, Maja-Louise Arendt, Khurram Maqbool, Matthew T. Webster, Michele Perloski, Olof Liberg, Jon M. Arnemo, Ake Hedhammar and Kerstin Lindblad-Toh.